March 22, 2015 By This post may contain affiliate links. This post is brought to you by Eggland’s Best Eggs. 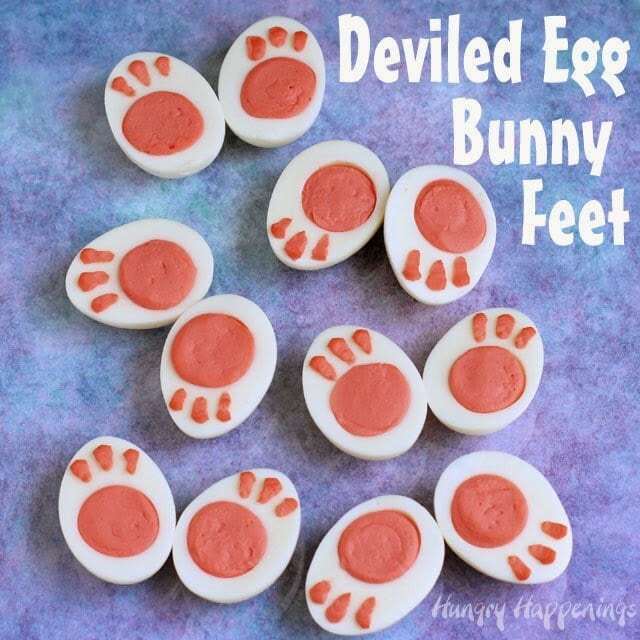 I’m going to guess that even my family, who’s used to eating my edible crafts at holiday meals, would be surprised to find a platter full of these Deviled Egg Bunny Feet on the dinner table this Easter. 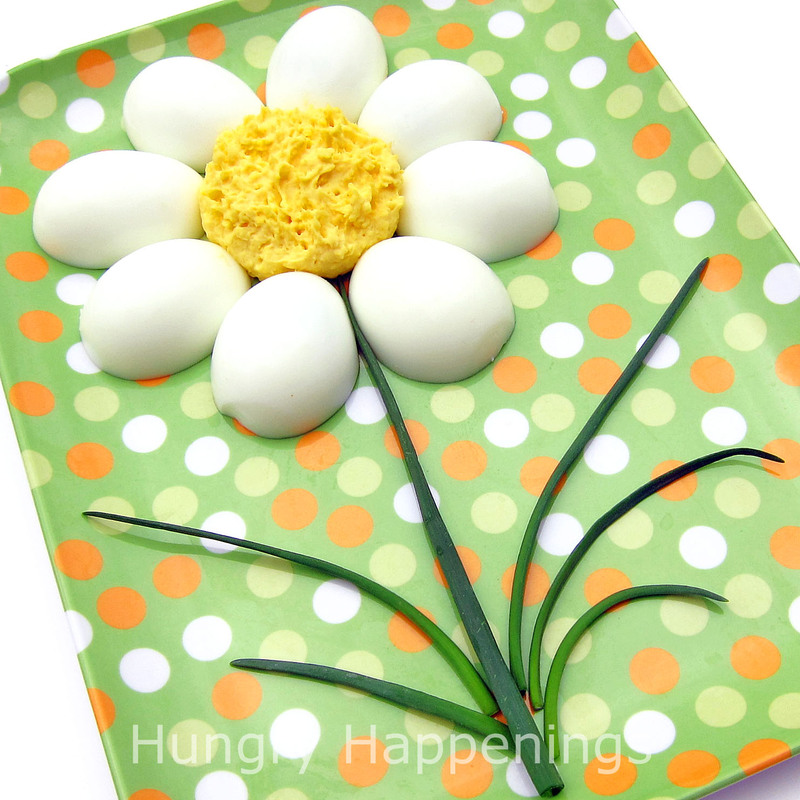 Our family, like so many of yours, has a tradition of serving deviled eggs at Easter dinner. It makes sense to put all those dyed Easter eggs to good use. 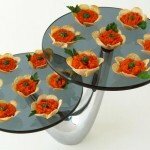 Plus, they are pretty darn easy to make. 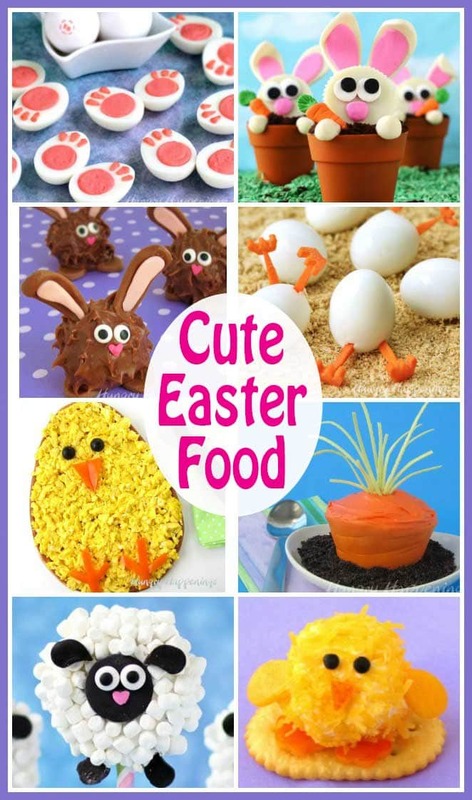 These festively decorated eggs aren’t much more work but look like so much more fun. Speaking of fun, how would you like to become Eggland’s Best next CEO, Chief Egg Officer, and win a prize of $5,000, a nutrition consultation with Tammy Lakatos Shames and Lyssie Lakatos (The Nutrition Twins,) and a year’s supply of Eggland’s Best Eggs? From now until March 24th you have a change to tell EB why their eggs are the only eggs for you and why you’d make a great CEO. Just fill out a submission form on the Eggland’s Best website, and share how you’d make a great Chief Egg Officer for your chance to win. 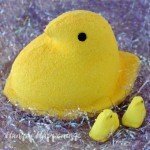 Sounds like fun to me.If you are looking for some inspiration as to what to write about in your submission you might be surprised to learn that compared to ordinary eggs, Eggland’s Best eggs have four times more Vitamin D, twice as many omega-3’s, and ten times as much vitamin E than ordinary eggs. That’s some pretty impressive stuff. 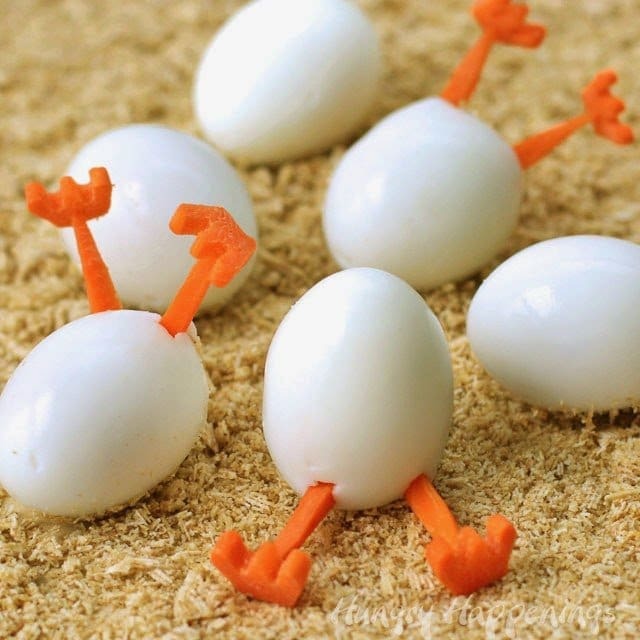 I realize only one person will be named the next CEO, but two others will also win $500 and a years supply of EB eggs. It would be so cool if any of those prizes went to one of you. 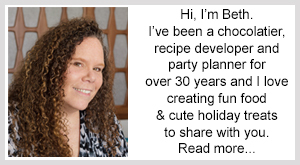 *I grew up eating my deviled eggs made with just Miracle Whip, but there are so many ways to make them that I thought I’d give you two options. The paprika is added for color and taste but the pink food coloring adds enough color, so you can leave it out if you like. ** If you are opposed to using food coloring, you can find all natural red coloring at health food stores or on-line. You can also increase the amount of paprika or add a bit of beet juice. To make easy to peel hard boiled eggs, it’s best to use older eggs. I try to buy eggs a few weeks before I’m going to use them to make hard boiled eggs. 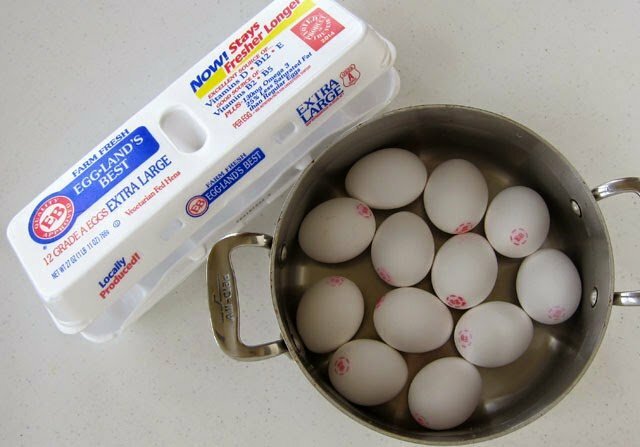 Arrange your eggs in a pot and pour cold water over top until it measures 1 inch above the top of the eggs. Heat on medium-high heat just until the water starts to boil. Small bubbles will become large and the eggs will begin to dance around the pan just a bit as it comes to a boil. Remove from the heat and cover with a tight fitting lid. Keep covered for 17 minutes. 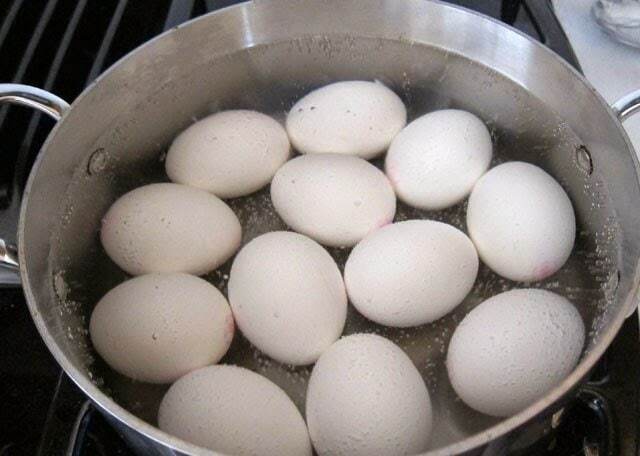 If your water has come to a rip roaring boil, you’ll only want to keep the eggs covered for about 12 minutes. Remove lid and drain off the hot water. Fill pan with cold water. Drain that cold water then fill the pan with ice water. 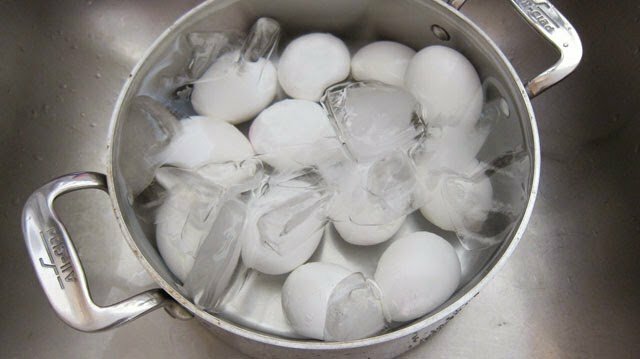 Let the eggs sit in the ice water for 15 minutes in order to cool the eggs completely. For best results, refrigerate the eggs overnight before peeling. 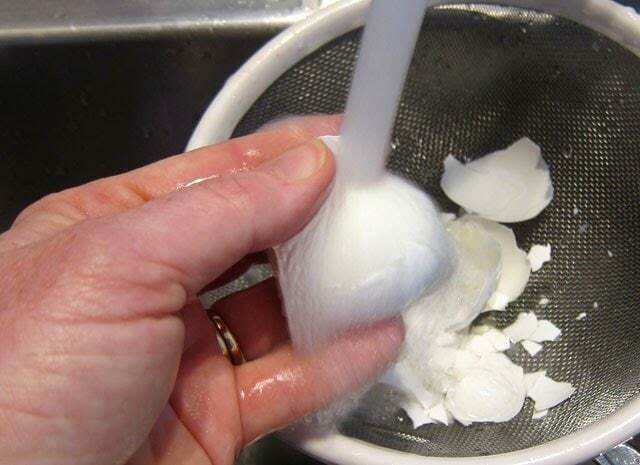 Crack both ends of the egg shell then peel under running water. 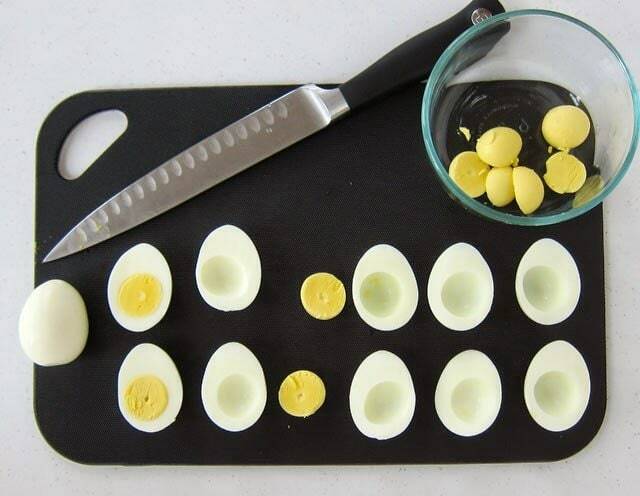 Cut your eggs in half and remove the yolks. Place yolks in a bowl and smash using a fork. 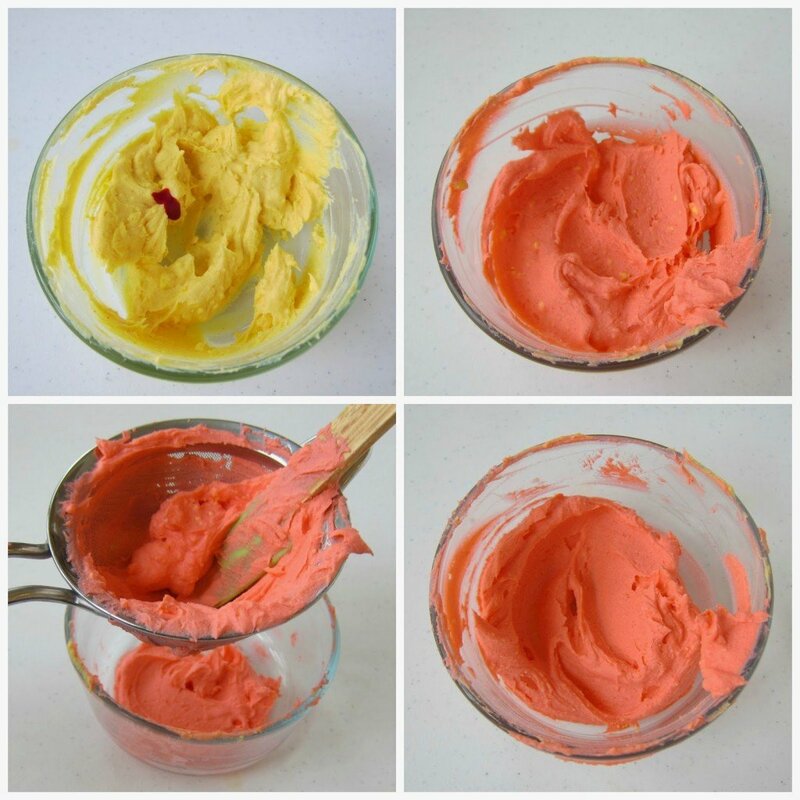 Stir in deviled egg ingredients including pink food coloring. The mixture will look a bit orange. If you want a truer pink, you’ll need to also add some white food coloring. I would have use some, but I didn’t have any on hand. To get a nice smooth filling, press it through a fine mesh sieve. It’s really thick and will stick to the bottom of the sieve, so just scrape it off into the bowl. 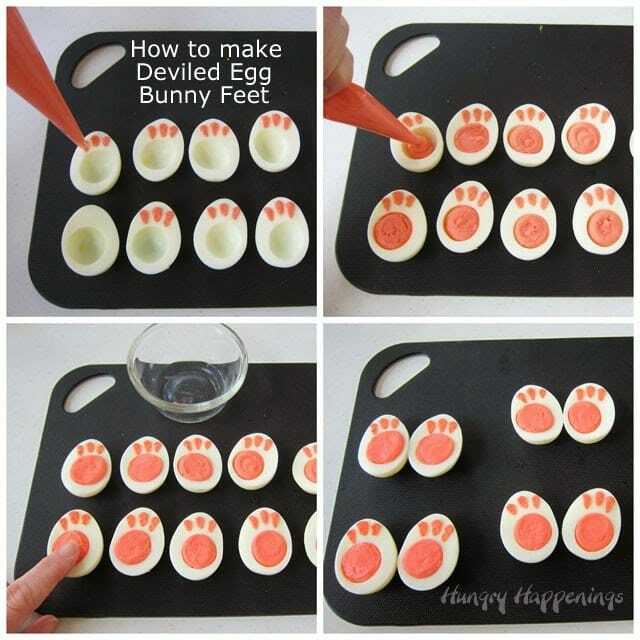 Be sure to mash all the chunks of egg yolk so that no big lumps remain.If you skip this part you may find it challenging to pipe the bunny’s toes. Spoon the deviled egg filling into a pastry bag or a large zip top bag and snip off the tip. Pipe three toes on the white curve of each egg then fill with filling. If you want the pink pad on the feet to look smooth, dip your finger in some water and press down on the filling to smooth it out. 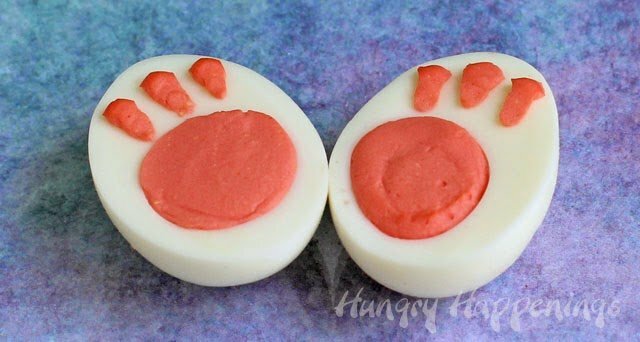 Your Deviled Egg Bunny Feet are ready to serve. 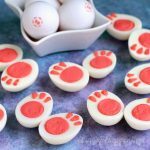 I was compensated by Eggland’s Best for using their product to create these Deviled Egg Bunny Feet and am so happy to have them sponsor this giveaway. Be sure to stop by and check out their sites. I like bacon in my deviled eggs. Usually a little mayo and horseradish. I like mayo, a pinch of sugar, vinegar and some mustard. 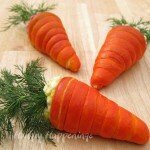 Plus a sprinkle of paprika or dill for garnish. These bunny feet eggs are so cute! I've never done anything creative with deviled eggs other than pipe them with a star tip, which is not very creative at all. I'm inspired to try some new things, both in and with deviled eggs. I love the bacon suggestion! I just thought of beets. 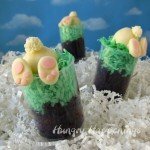 I think they'd be really tasty in a deviled egg, plus would make a lovely shade of bunny feet! Grew up with Miracle Whip in my deviled eggs so that is what I still do. But I do up the heat with hot sauce. 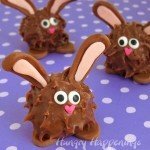 So stinkin' cute and delicious! Mayo, mustard and pickle juice. I like to put mayo in deviled eggs. I love paprika in my deviled eggs. I put mayonnaise, mustard, and pepper.